For the third year running, Heather and Tony organised special Yoga classes as part of World Yoga Day to raise money for ‘Medecins sans Frontieres’ on Sunday 31st January at River Bourne Health Club, Chertsey. 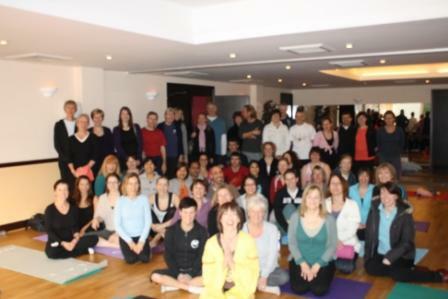 52 Yogis and Yoginis took part and a further 10 made donations raising a total of £700 with money still coming in. Tony provided an introduction to World Yoga Day and ‘Medecins sans Frontieres’ and then two classes were provided by Heather with fellow Yoga teachers and friends Garry Freer, Jean-Claude Rawady and Becky Lennox. There is an album of photos on Facebook. World Yoga Day is a 2 hour Yoga practice from 11am to 1 pm in every time zone around the world thus leading to 24 hours of continuous Yoga to support human rights. We joined 359 other Yoga schools from 42 countries. It started in New Zealand, then crossed Australia, Japan, Malaysia, Indonesia, mainland Asia including Russia & Iran and then Africa and into mainland Europe. As the United Kingdom, Portugal and Ireland joined there were 278 schools all practicing Yoga at the same time. As we finished we handed over to Brazil and Uruguay. Then classes spread across South America, Canada and the USA. The final classes were held on the west coast of California. The only continent not represented was Antarctica, has anybody thought of offering Yoga for penguins ? Médecins Sans Frontières is an independent international humanitarian organisation that delivers emergency medical aid to people affected by armed conflict, epidemics, natural and man-made disasters or exclusion from health care in more than 60 countries around the world. It just could not be more poignant at this time because of the recent disaster in Haiti. Haiti is one of the poorest countries in the world having suffered political, economic and natural disasters over many years. MSF were already working there with three medical centres in the capital Port au Prince. These were damaged and staff injured during the earthquake. MSF ramped up their support to treat the injured in temporary medical centres, flying in further staff, equipment and supplies. They are now undertaking post-operative care for the injured, see below for details. Heather and Tony would like to thank all those that participated or made donations, the other teachers and also Steve Watts, Graham Dollery and the managers and staff of River Bourne Health Club who worked so hard to create a welcoming environment and helped make it our best World Yoga Day so far. Yet again they provided their facilities for free, so that all money raised would go to the charity. The range of work that MSF is now carrying out in Haiti with the survivors of the earthquake has been increasing as the needs and priorities shift but the core medical services in hospitals and clinics still dominate. Examples of those come from projects in Port-au-Prince, where the teams are working in rather different surroundings. In what is known as "New Carrefour Hospital", surgeons performed 40 operations yesterday. They are working in two school buildings that survived the quake because the original hospital next door was finally made unsafe by aftershocks. In the neighbourhood of Carrefour Feuille, a small team of two nurses, a doctor and an obstetrics specialist are running a clinic from a tent in an area where 9,000 people have now made temporary homes. They are still seeing people with injuries from the quake coming for help but also increasing numbers with diarrhoea and fever. The successful creation of more medical facilities has seen new developments in the capital and outside. A post operative "village" has been assembled in tents in an area called Delmas 30. Patients will be taken there from other MSF hospitals to recover from their operations. This kind of care is one of the greatest needs in Haiti at the moment, as Brigg Reilley, an MSF epidemiologist in who is there to analyse health requirements explains. "The most serious cases are going to continually need dressing and regular cleaning, all part of a very nursing-intensive process. We're eventually going to need skin grafts and prosthetics. These will be needed not only in the next days, but in the coming weeks, months and beyond. Even after the current media spotlight on Haiti fades, there will be patients with extensive orthopaedic needs as a result of the earthquake." A similar provision is now available in what was kindergarden "Mickey", which is now a 60-bed facility but has the potential for 180, and in Bicentenaire, a former private clinic, there are another 30 beds. In a secondary school in the Champs Mars area, a clinic has opened which will soon provide in-patient facilities as well. Outside Port-au-Prince, in the town of Jacmel which was hit especially hard by the quake, MSF is now working with the local hospital to provide care in their building and in tents surrounding it. One of the other expanding areas of work has been in water provision. MSF now has the material and specialist staff in Haiti to start helping some of the communities in the areas where we have medical services. A new clinic has opened in Grace Village and the team are also taking responsibility for supplying water to the 15,000 people in the area. Near the Chancerelle Hospital, MSF is using water bladders to supply a community that is camped in the open. A similar project is underway near kindergarden Mickey. Within the EU a European transfer is for free. All you need is the IBAN and the SWIFT-BIC Code. Please Email Heather to let her know you have made a donation.